Of Course, no valentine's day gift would be complete without chocolates. We have added some cocoa love to raise your sugar-love. This gift is sure to elate someone from age fifteen to eighty five. In a joyful golden-brown wrapping these chocolates combine love and sugar in the most well-balanced way to touch your lover's heart strings. The image displayed is indicative in nature. Actual product may vary in shape or design as per the availability. Flowers may be delivered in fully bloomed, semi-bloomed or bud stage. The chosen delivery time is an estimate and depends on the availability of the product and the destination to which you want the product to be delivered. 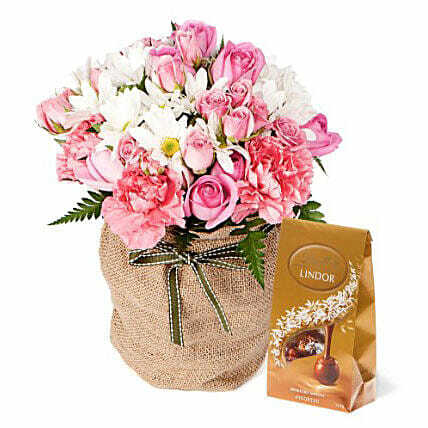 Since flowers are perishable in nature, we will be able to attempt delivery of your order only once. The delivery cannot be redirected to any other address. This product is hand delivered and will not be delivered along with courier products. Occasionally, substitution of flowers is necessary due to temporary and/or regional unavailability issues. When your flowers arrive, just trim the stems and add water. Re-cut 1-2” of the stems at a 45 degree angle. Use a clean vase and clean water. Remove the leaves below the waterline but do not remove all leaves along the stem length. Check the water level daily and replenish as needed. Don’t place flowers in direct sunlight or near any other source of excessive heat. All flowers benefit from a daily mist of water. Enjoy your flowers! Store your chocolates in the refrigerator. If they are exposed to high temperatures, they may begin to soften, compromising the appearance and flavour. Please refer to the expiration date on the package and consume your chocolates before that.